In the previous videos in this module, we've learned that the following statements are equivalent. We could say 7 is a factor of 91. We could say 7 is a divisor of 91 or we could say 91 is divisible by 7. All three of those statements contain the basic mathematical information. And there's another way to say this also. We can say that 91 is a multiple of 7. Throughout this video, assume that capital P, capital Q and r are positive integers. If we are given that P is a multiple of r, this means I could multiply r by some positive integer and the product would be P. In other words, r is a factor of P and a divisor of P and so multiple and factor have an inverse relationship. If P is a multiple of r, r is a factor of P. So for example, 75 and 1250 are multiples of 5, in fact, any number that ends in 5 or ends in 0 is a multiple of 5. 63 and 888 are multiples of 3, as we talked about in the divisibility video. 8 plus 8 plus 8 is 24. The digits add up to something divisible by 3, the number's divisible by 3. And so both of those are multiples of 3 because they're divisible by 3. Multiple idea number 1, just as 1 is a factor of every integer, every positive integer is a multiple of 1. 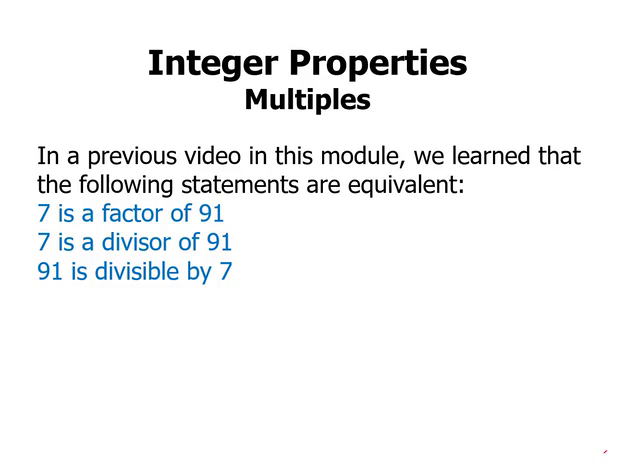 So it doesn't really make sense to talk about multiples of 1 because all the positive integers are multiples of 1. Just as every positive integer is a factor of itself, every positive integer is a multiple of itself. That's a bigger idea. So 5 is a factor of 5. 5 is also a multiple of 5. In fact, 5 is the only number that is both a factor and a multiple of five. Multiple idea number 2, if we need, say, the first five multiples of a number, we simply multiply that number by the numbers 1, 2, 3, 4, 5. So, for example, supposed we needed the first five multiples of 12, we just multiply 12 by those five numbers, we'd get 12, 24, 36, 48 and 60. Those are the first five multiples of 12. And notice we can also get there by starting with 12, and just adding 12 over and over again. 12 plus 12 is 24, plus 12 is 36, plus 12 is 48, that sort of thing. If we know that P is a multiple of r, then it must be true that if we add or subtract r, we'll get more multiples of r. And suppose we're just told, you don't need to know this off the top of your head, but suppose you're just told, that 2401 is a multiple of 7. I'll just mention, in fact, that's seven to the fourth, but you don't need to know that. Suppose you're just told that 2401 is a multiple of 7. Well then, we could add seven and we'll get more multiples of seven. And so plus seven, we get 2408, plus seven, we get 2415, plus seven, we get 2422. Instead we could start at 2401, subtract seven, we'd get 2394. Subtract seven again, we'd get 2387. All of these are more multiples of seven. And so, it's very easy if you're given one multiple of seven, to get a bunch more by adding and subtracting. Where in general, if you're given one multiple of r, you can get many more multiples of r. Multiple idea number 4, if P and Q are both multiples of r, then either the sum of two multiples or the difference of two multiples must also be a multiple of r.
We can add or subtract different multiples of r to get more multiples of r. So 700 obviously is a multiple of 7, 49 is a multiple of 7. Those are two things it's easy to see because obviously 7 is a factor of 700, 7 is a factor of 49. So what this means is, I can add 7 and 49, and I'd get a new multiple of 7. Or I could add 49 to that again, I'd get 798, that's another multiple of 7. I could start at 700 and subtract 49, 651, that's a multiple of 7. Subtract 49 again, 602. So these are 4 more multiples of 7 that I've created just by adding and subtracting known multiples of 7. Along these lines, notice the following. 36 is a multiple of 13. So we could add two 52's or three 52's, or any number of 52's, and it would still be a multiple of 13. In other words, any multiple of 52 is a multiple of 13. We can generalize this rule. If P is a multiple of r, then any multiple of P is a multiple of r.
That's a powerful idea. If P and Q are multiples of r, then the product P*Q must also be a multiple of r. That kind of follows directly from fact number five. We can multiply P by anything might as well multiply it by another multiple of r and you'll definitely get a multiple of r. So, for example, 24 and 80 are both multiples of 8. To get more multiples of eight, we could add those two, we could subtract them, we could multiply them. All of these produce more multiples of eight. The one thing we can't do is divide them. If we divide 80 by 24, the quotient isn't even an integer. So it's certainly not a multiple of anything. Here's a practice problem. Pause the video, think about this, and then we'll talk about this. Okay, we're told that these four numbers K, (K + 200), (K + 350), and 15*K are all multiples of P. Then, P could equal, which of the following? Well, we're gonna be careful here. First of all, notice that if we know that K is a multiple, the fact that 15*K is a multiple, that's kind of the fact, that will always be true. So that doesn't help us at all. But these three, notice we can subtract. What is (K + 200) minus K? Well that's just 200. So 200 is a multiple of P. What's (K + 350) minus K? Well, that would just be 350. And so, if (K + 350) and K are both multiples of P, we could subtract them and we get a new multiple of P. So 300 and 250 are multiples of P.
Now, suppose we subtract these two, 350 minus 200 is 150. Now suppose we subtract 200 minus 150, then we just get 50. And so, all of these numbers, 200, 350, 150 and 50 are multiples of P.
And it makes sense to concentrate on the smallest one, which one could be a factor of 50? Well, the only one on this list that can be a factor of 50 is 25. So 50 is a multiple of 25, it's not a multiple of anything else on that list. And so the answer has to be B. In summary, we discussed multiples and their relationship to factors and divisors. If P is a multiple of r, we can add or subtract r any number of times to get more multiples. If P and Q are multiples of r, then the sum, difference, or product will be other multiples of r, and any multiple of P or Q would be another multiple of r.